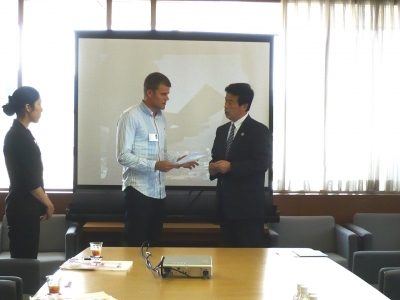 The mission of World Campus International is in many aspects to interact with Japanese communities in order to obtain a better understanding of Japanese culture, norms and values. And my first interaction with a Japanese community really made it clear to me about how excited the people are in sharing their traditions, working methods, and ways of thinking with us. They were also really eager to hear about our preconceptions of Japan. On our first courtesy visit, we went to visit the mayor of Ueda City. Yuki, a staff member, acted as the translator, as Japanese was the spoken language during the visit. The tone was friendly and polite but also formal. The mayor and his staff had prepared a nice PowerPoint introduction, telling us some facts about Ueda City; geographic placement, attractions, and number of inhabitants. With 160.000 residents, Ueda City is the third largest city in Nagano and it is known for combining industry, academics, and technology in a harmonious matter. Furthermore, this city has many sister towns around the world including Broomfield, Colorado and Davos Town in Switzerland. I really noticed how the entire city takes pride in their nature; especially their minerals and fireflies. Regarding the fireflies, the locals actually have a yearly festival, showing their attraction to the rest of the country. In fact, the mayor invited us to partake in the upcoming ceremony. Finally, we received memorial gifts from the mayor, which included an elegant cloth towel. We also gave the mayor letters written by politicians and businessmen from our home countries.